Membership in BMWCSA includes our Newsletter. For 2017, we will be experimenting with two newsletter formats that we hope will entertain and inform our members while reducing the cost and effort. Please be patient with us as we develop these formats – BMWCSA is a volunteer and not-for-profit organization–and it will be a journey of continuous experimentation and, hopefully, improvement! 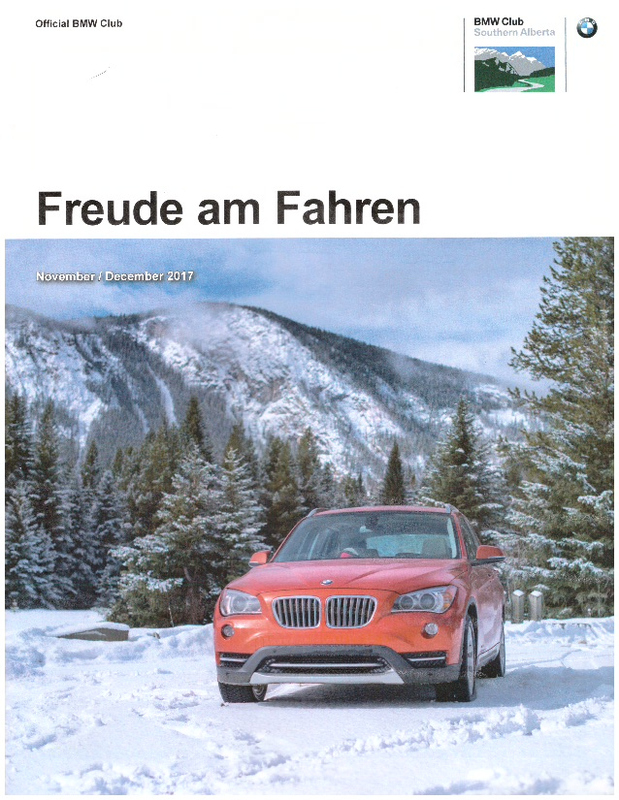 The old Freude am Fahren will be produced in a 16-page format delivered and mailed to your home and to our advertising sponsors. It will continue to offer a mix of club activities, news and technical articles. Due to the work and high costs involved, we are targeting for four issues per year on a quarterly basis. Joy of Driving is our new monthly digital effort designed to fill the months in between the quarters. It will be emailed and devoted more to reporting on club activities and news flashes. It is an approach now used by many clubs as part of the trend to E-News. We are open to all comments, letters to the editor, articles, photos and especially any help. Please contact Chris Tworek at Tworek@bmwcsa.ca or 403-238-8049. Ideas and opinions are those of the authors, without authentication by or liability to BMWCSA, its Editors, Directors or Officers. Material in the newsletter may describe vehicle modifications or procedures to achieve them that may void your warranty, cause your car to fail emissions tests, or make your insurance company or agent unhappy with your customization. The BMW Club of Southern Alberta, its Editors, Directors and Officers are not responsible for any consequences that may ensue from such modifications. Please send newsletter article contributions and all communications concerning the newsletter to the editor, Chris Tworek at Tworek@bmwcsa.ca. BMWCSA reserves the right to modify or edit any material or submissions. To place an ad, please send exact text and pictures via email directly to the editor. BMWCSA welcomes our sponsors to advertise in our newsletters at commercial rates. Please contact Chris Tworek at Tworek@bmwcsa.ca or 403-238-8049 for details. Print Deadline for Articles: 20th of the month preceding or by arrangement with Editor. Print Deadline for Classified and Commercial Ads: the last Wednesday of the preceding month. Please submit photos at minimum 200 dpi at 100% in tiff or jpg format and text in MS Word, alternative format by arrangement with editor. Send to membership@bmwcsa.ca. Do not send advertising copy to this e-mail address.